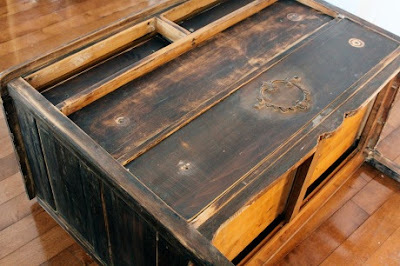 The Collected Interior: A Trash to Treasure...you've gotta see! A Trash to Treasure...you've gotta see! Okay, in the world of Trash to Treasure projects...I really thought I had seen it all! Until I came across this OLD guy over at Maple and Magnolia. 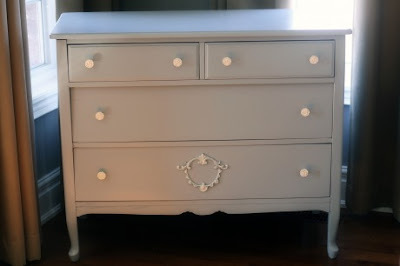 This dresser was purchased from Goodwill for just $9.99. It's so old, Susan posted the "Before" without the "After" because she didn't even know if there would be an "After"! It looks beautiful and I love the gray paint! What lovely transition! I just love that! She did a great job! Wow! I'm sure it was a great piece in its prime, but it looks long past that in the Before pic. She did a fabulous job! 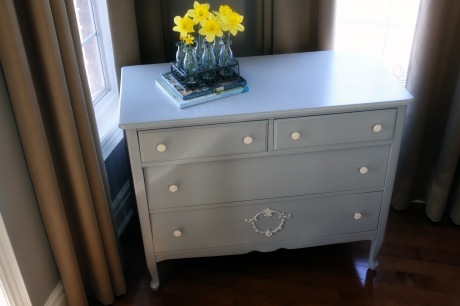 I love it gray and I love the white knobs and embellishment. What a great piece! The power of paint and a ton of hard work. Amazing. Oh, this truly is beautiful!!! So peaceful! LOVE the color!! You gotta have a vision! Ha ha Lou Cinda, Susan from Maple and Magnolia TOTALLY had a vision! She is amazing. In fact, she's guest posting Thursday...wahoo! I LOVE the color! This turned out so fabulous!!! Wow!! It turned out beautifully! !